In conjunction with Creek Developments Plc, the Msida Local Council is organising a Christmas Decoration Competition for the boats berthed in the Msida & Ta’Xbiex Marinas and the Fishermen’s Pontoon inside Msida Creek. The Best Decorated Pontoon competition is a team event for the boats on a particular pontoon and competition will be among other pontoons in the Marina, as well as the Fishermen’s pontoon. Msida Local Council will be switching on the Christmas Decorations in Msida on the 7th December, and ideally would like boats to switch on at the same time. Adjudication will take place between Christmas and New Year. Pictures of the decorated boats will be featured on Facebook as well as in the local media. 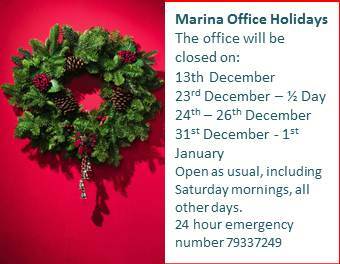 The Marina Office will be closed all day on the 13th December, half day on the 23rd December, from 24th-26th December and the 31st December -1st January 2014. Apart from these dates, normal office hours apply. Marina Security continues 24 hours as usual. View the Holiday Closing Dates of the Msida & Ta’Xbiex Marinas. Due to a scheduled upgrade to the power supply on the Breakwater, electricity on Pontoon O and the Breakwater will be off on the 4th December 2013 from 07:30 to 16:00. We apologise for any inconvenience.